By using the site or downloading materials from the site, you agree to abide by the terms & conditions set forth in this notice. If you do not agree with these terms & conditions, please do not use the site or download materials from the site. You may not distribute text or graphics from this site to others without written consent of SANTEC. Also you may not, without the permission of Santec, copy & distribute this information on any other server,or modify or reuse text or graphics on this or any another system. 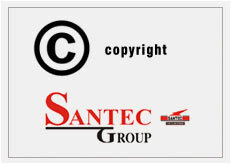 No reproduction of any part of the site may be sold or distributed for commercial gain, nor shall it be modified or incorporated in any other work, publication or site, whether in hard copy or electronic format, including posting to any other site, Santec reserves all other rights. The foregoing are subject to the laws of the Republic of India & the courts in Delhi, India shall have the exclusive jurisdiction on any dispute that may arise out of the use of this site. Please proceed only if you accept all the conditions enumerated herein above, out of your free will & consent.